It’s a package recommend for those who wants to experience a journey in one of the fastest train in India Or to those who wants to explore three UNESCO’s World Heritage Sites, wiz Taj Mahal, Agra Fort and Fatehpur Sikri in a Day Tour. Early morning our executive will pick you from hotel & transfer to railway station to board the super-fast luxurious air conditioned train to Agra. On srrival at Agra railway station, you will be received by your driver and guide for the day. After lunch proceed to visit tomb of Itmad-ud-Daulah. 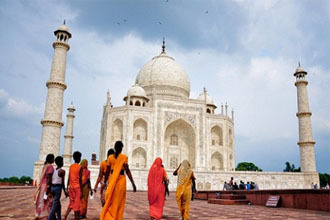 In the evening you can explore Agra's local dying arts and crafts which is last part of your Same Day Tour to Agra by Train. Now proceed to Agra railway station to board Gatiman express train depart at 17:50 , around 19:30 you will be in Delhi. 50-100 USD as an Advance Deposit.